Educational technology has survived its early challengesbut is it thriving yet? On the one hand, the educational technology movement (and it is, in fact, a movement) has much to celebrate, having realized a number of its cherished aspirations. On the other hand, truly innovative technological breakthroughs remain rare, student disengagement and distraction continue to frustrate faculty, and misconceptions about learning stubbornly persist. In this plenary session, we will take a look at some outstanding examples of what evidence-based, engaging, technologically-enhanced teaching can look like in practice. We will then consider approaches, resources, and techniques that could help us push past some of the biggest challenges faced by our movement. 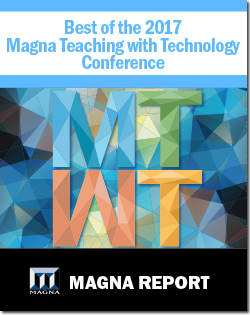 These approaches include making students our allies in the fight against distraction and disengagement; explicitly considering cognitive principles when developing, incorporating and evaluating new technologies; and nurturing faculty and instructional designers as an importantperhaps the most importantsource of truly useful, truly innovative ideas for teaching and learning with technology. Dr. Michelle D. Miller is director of the First Year Learning Initiative, professor of Psychological Sciences, and presidents distinguished teaching fellow at Northern Arizona University. Millers academic background is in cognitive psychology; her research interests include memory, attention, and student success in the early college career. Miller co-created the First Year Learning Initiative at Northern Arizona University and is active in course redesign, serving as a redesign scholar for the National Center for Academic Transformation. She is the author of Minds Online: Teaching Effectively with Technology (Harvard University Press, 2014), and has written about evidence-based pedagogy in scholarly as well as general-interest publications including College Teaching, Change: The Magazine of Higher Learning, and The Conversation. Millers current work focuses on using psychological principles to help instructors create more effective and engaging learning experiences, and to help students become more effective learners. What Role does/should the 3Ts of Technique, Tools, and Time Play in Modern Educational Practices? Some 108 years ago, Thomas Edison envisioned a changing role for educational practice as a result of his motion film picture technology. Since that time, others have looked to audio visual training, instructional TV, and programmed instruction as mechanisms that can positively impact teaching and learning. Today, modern technologies, largely associated with the development of computer systems and other devices offer real potential to bridge cultural, political, religious, and economic divides. However, similar successes appear to be somewhat measured in educational settings. The marriage relationshippedagogy and technologyhas not always worked well for any number of reasons possibly in part to the tool itself (possibilities or limitations), its adaptability, access, cost, or support. But, are there other underlying issues at play here that still threatens to impact the effective utilization of technological tools in the academy? What use are discussions about tools without some understanding about the techniques needed to maximize a tools effectiveness in multiple settings? What teaching and learning opportunities can educators and students take advantage of when technological tools are leveraged with proven practices to gain knowledge and understanding about what is possible? Furthermore, what factors should be considered regarding the efficient use of time in task achievement and task completion of identified learning goals in face-to-face and online settings? Tools, Technique, and Time, the 3 triplets of ePedagogy cannot be looked at in isolation. An examination of the 3ts will be conducted with the intent of revealing through examples how the triplets can be applied/used in a complimentary fashion to help faculty and students achieve their collective identified educational objectivesincreased learning and understanding with targeted applications. Dave Yearwood, PhD, CSIT, is professor and chair of the technology department at the University of North Dakota. Yearwood has been teaching in higher education for almost 26 years, and his experience reaches across two academic tracks: technology and higher education. In technology, Yearwood's focus is on electronic control systems and the effect of technology utilization for consumer and commercial use. In higher education, Yearwood taught graduate education courses in curriculum development, assessment, adult learners, and instructional technology. Yearwood's study/research and publications (including a book chapter on Podcasts) on instructional technology focuses primarily on electronic pedagogy--how faculty infuse presentation or other technologies into their practice to connect and engage students, enhance their understanding of course content, and promote dialogue that leads to a critical examination of a topic/subject under examination. How can educators become designers of learning? And how might new designs for learning connect formal curriculum with students' everyday interests, enhance commitments to educational equity, and preserve agility in response to institutional dynamics? Remi Kalir will share his experience and research as a pedagogical journeyman and educational bricoleur. He will discuss how to design and create learning environments, learning opportunities, and learning technologies. Educators will be guided through a series of participatory activities that will encourage them to identify their personal design principles and brainstorm design practices leading to learning that is critical, creative and connected. Remi Kalir is assistant professor of Information and Learning Technologies at the University of Colorado Denver School of Education and Human Development. Kalirs research about educator learning and everyday digital media practices has been supported by a 2017-18 OER Research Fellowship from the Open Education Group and a 2016 National Science Foundation Data Consortium Fellowship. He is currently chair of the American Educational Research Associations Media, Culture, and Learning Special Interest Group, is Co-PI of ThinqStudio, CU Denvers digital pedagogy incubator, and serves on the board of directors for InGlobal Learning Design.